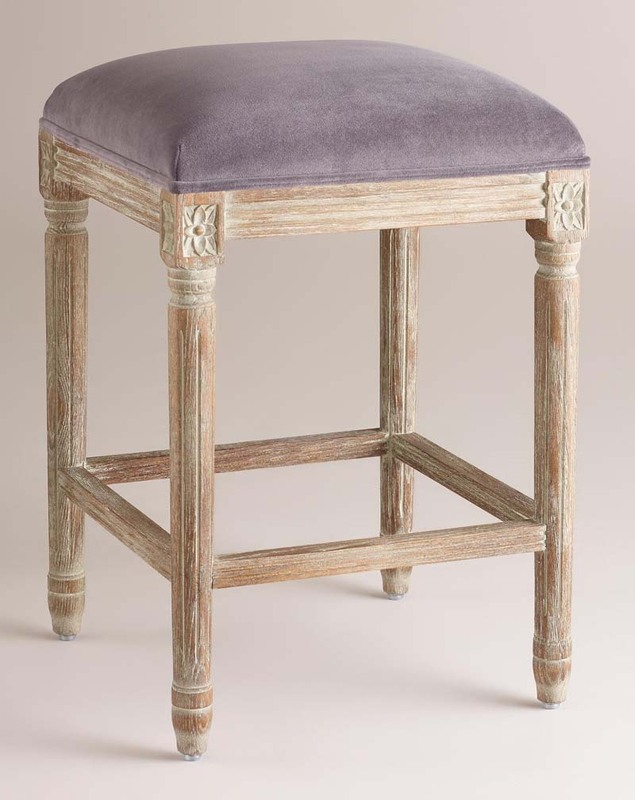 An elegant take on a classic, this backless Plum Velvet Paige Backless Counter Stool is crafted of American white oak with carved details and a distressed finish. 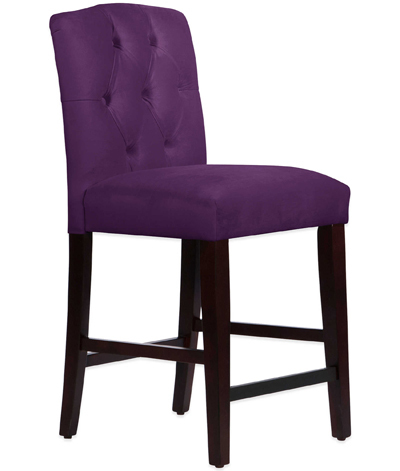 Plush velvet upholstery makes this exclusive stool a sophisticated seating update for your bar or kitchen. $149.99. Buy here. 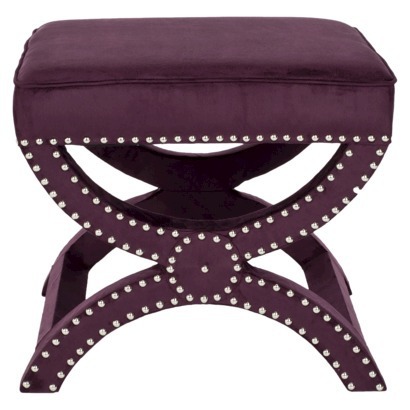 This angelo:HOME Duncan Large Two Diamond Ottoman would make a stylish functional accent to any living room. Versatile transitional design can serve as a stylish foot rest, fashion-forward cocktail table, or a chic additional seat. $179.99. Free shipping. Buy here. 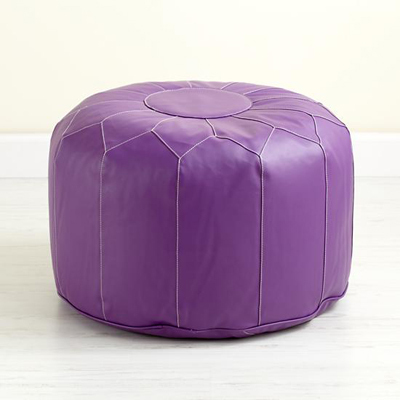 This clever Faux Leather Pouf is modeled after traditional Moroccan poufs. It can double as a comfy play chair and an ottoman.$79. Buy here. 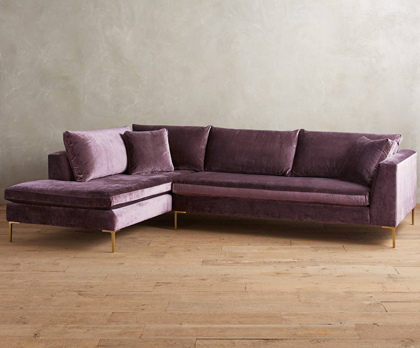 Boasting clean lines and a neatly-proportioned seat, this Slub Velvet Edlyn Left Arm Sectional re-imagines modern Italian design with down-wrapped cushions, brass legs and a gently reclining back. $3,748. Buy here. Provide beautiful seating in your kitchen, dining room, or bar with the Denise Tufted Arched Counter Stool from Skyline Furniture. Features exquisite diamond tufting details, luxurious velvet fabric upholstery plus plush foam padding. $270.99. Free shipping. Buy here. 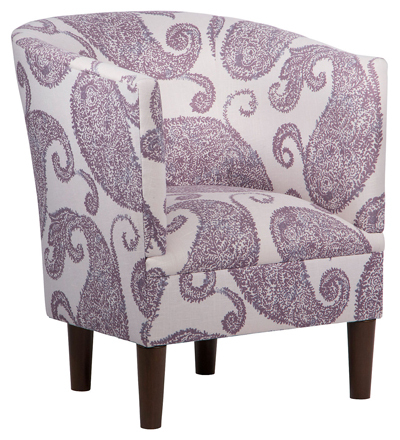 This timeless Purple Troy Tub Chair gets a modern update thanks to its bold, tailored upholstery. Handcrafted in the USA. $660 Sale $329. Buy here. 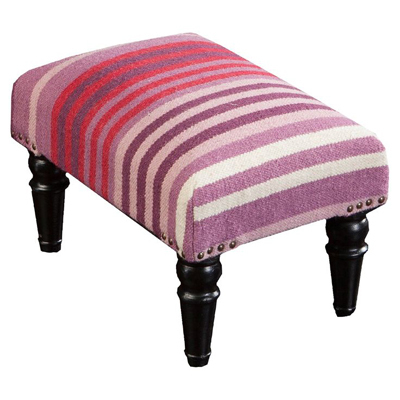 Multi-colored stripes and brass nailhead trim add sass to the Eggplant Stripe Surya Ottoman. Its small rectangle design ensures this piece will radiate incomparable charm into any size space. $307 Sale $184.20. Free shipping. Buy here. 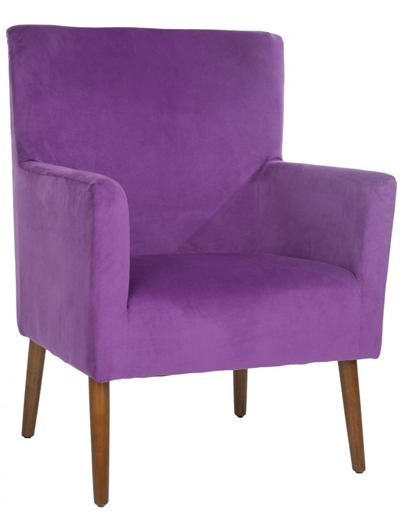 Add a bit of mid-century modern flair to your living room with the Purple Allegory Chair. Featuring tapered legs and a retro-inspired silhouette, the chair will be a unique addition to your home. $564. Buy here. 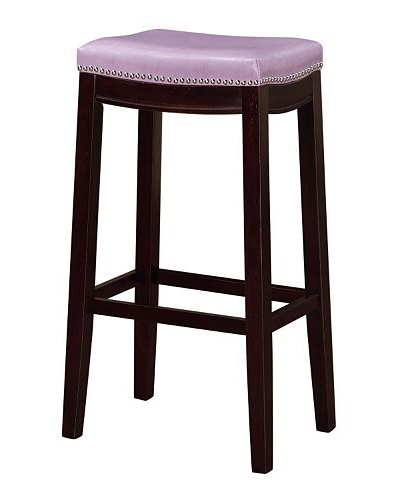 The Lavender Linon Allure Bar Stool features bold lines and nailhead trim that create stylish appeal. Cushioned seat provides exceptional comfort. Sturdy construction ensures long-lasting use. $149.99 Sale $74.99. Buy here. 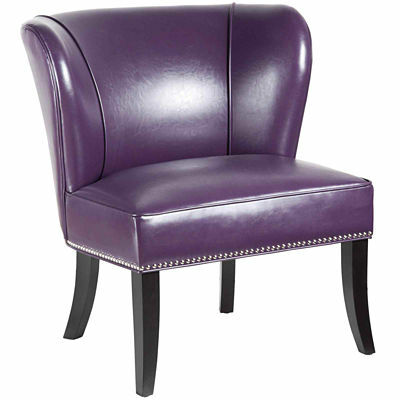 Make a contemporary style statement with this Purple Sabrina Accent Chair featuring a concave, armless design, nailhead detailing and brightly colored faux-leather upholstery. $720. Buy here. 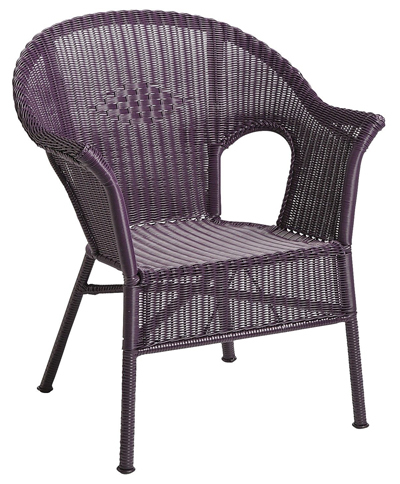 The Purple Casbah Chair is made from natural-look synthetic rattan woven over a sturdy metal frame that makes for casual all-weather comfort, indoors or out. Sized for patio or porches and stackable for easy storage. $119.95 Sale $49.98. Buy here. 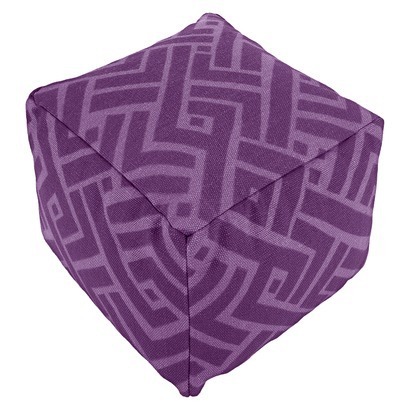 This Purple Pouf from Threshold adds color and comfort to any room. $59.99. Free shipping. Buy here. Classic tufted fabric gets a modern update in a versatile shape with a fluted leg. 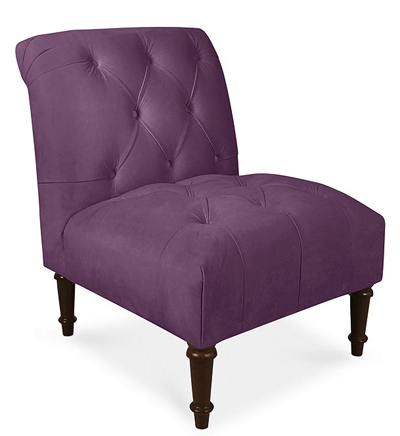 A comfort staple for any space, this charming Bradbury Velvet Tufted Accent Chair has a traditional silhouette that looks good with any color palette. $570 Sale $349. Buy here. 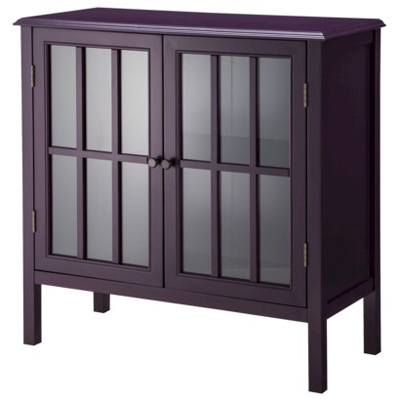 The Threshold Purple Windham Accent Cabinet combines classic style with contemporary design for a beautiful, timeless look. This storage cabinet has double glass doors and an adjustable shelf. This hardwood cabinet features clean lines and a rich, bold finish. $149.99 Sale $119.99. Buy here. 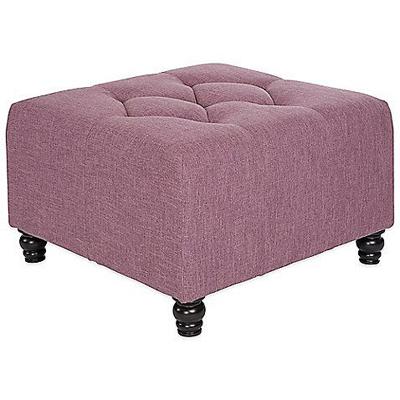 This Safavieh Mystic Ottoman can be positioned at the end of bed for seating or in a living room as a foot rest or extra seating. $219.99 Sale $175.99. Buy here. 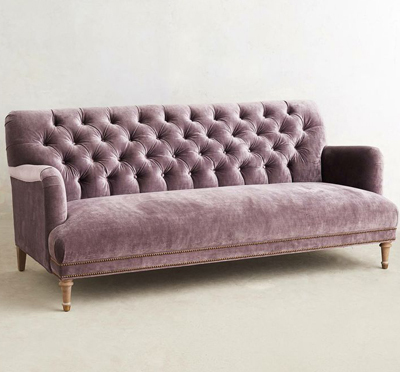 This tufted Amethyst Orianna Sofa is inspired by a sofa spotted by buyers at a London antiques market. They loved it so much that they decided to give it a modern twist with recessed English rolled arms and sumptuous upholstery to match your favorite armchair. $1998. Buy here. 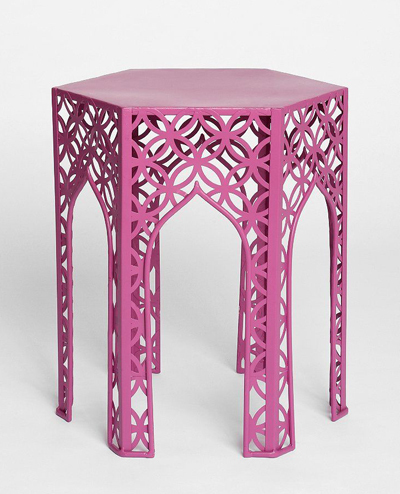 This geo-fab Hexagon Side Table from Magical Thinking is made from iron. 20.25″ tall. $129. Free shipping. Buy here. 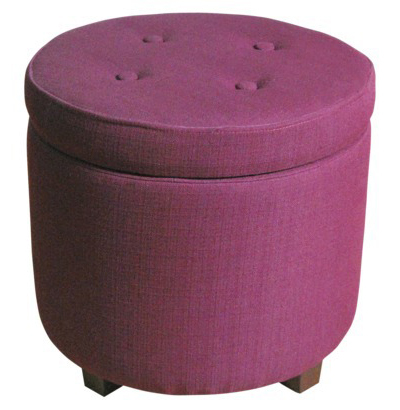 This Round Tufted Storage Ottoman from Threshold makes a style statement in any room. The tufted cover is removable to allow for storage. $59.99 Sale $48. Buy here. 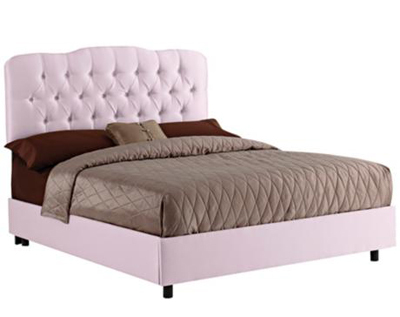 A diamond-tufted headboard gives this Lilac Shantung Tufted Bed a traditional feel. The sheen of shantung in a delicate shade of lilac gives it an updated twist, as does a low, boxy design with small feet. $549.91-$599.91. Buy here. 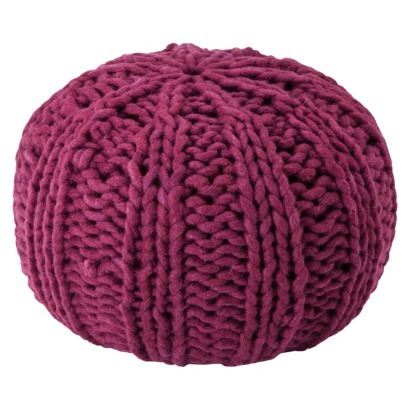 This Purple Cable Knit Pouf is a great alternative for extra seating in your home. Made of 100% wool. Cluster two or three poufs or go solo for great visual appeal. $49.99. Buy here.